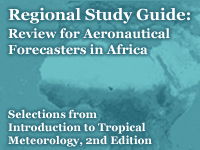 This Regional Study Guide highlights the sections of the Introduction to Tropical Meteorology, 2nd Edition online textbook that are applicable to aeronautical forecasting operations in Africa. Topics include remote sensing, global circulations, tropical variability, tropical cyclones and the challenges encountered when forecasting tropical weather. The guide consists of a list of links to the content in the textbook and has its own stand-alone quiz.